Coat of Arms Shield featuring your family Coat of Arms and Family Crest. Shields are made of a solid wooden back, or plaque with a full Pewter or Brass casting mounted in the middle. The Coat of Arms Shield is handcast out of your selected metal – Brass or Pewter and handpainted in accordance to your Family Coat of Arms and Family Crest design. We first need to identify if your family has an authentic and recorded Coat of Arms and Crest. Not all names were awarded a Coat of Arms. Ironically, it is in this modern world, reeling under the impact of the technological age that the ancient arts and historical heraldic memorabilia are gaining a new lease of life. Your family Coat of Arms Shield takes around 6 weeks to be made and delivered. The process is slow, but this ensures attention to detail. Not only are the wooden plaques shaped, sanded and stained, the metal casting has to be poured, cooled and sanded prior to painting. 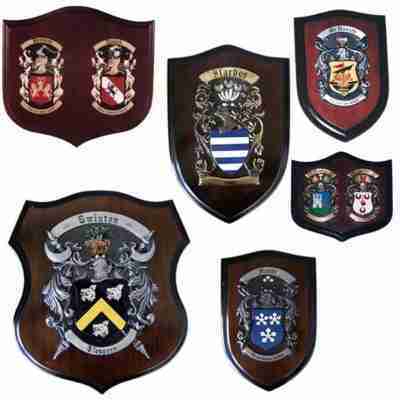 You have 3 sizes to choose from and 2 metal types for your family Coat of Arms Shield. Small Plaque – 245mm high x 165mm wide. This measurement is for the wooden backing. The metal casting sits inside this. Medium Plaque – 340mm high x 225mm wide. This is the one we most likely recommend due to its presentability on the wall. The size allows for details to be seen easily. Large Plaque – 435mm high x 405mm wide. This is a very large Coat of Arms shield and weighs a little over 5kg when made in brass. It is a stunning feature to add to any wall, particularly those serious about their family history and who take pride in their origins.